Round 5. Some of the U130 section in action, skillfully taken to obscure most of the faces! In the foreground Jack Healings already finds Pete Tideswell's game more interesting than his own. Home bargains, whose sponsorship has enabled me acquire an assistant, increase the number of sections and prizes per section, and provide Parker Pens and certificates as mementoes to section winners. John Day who liaised with the bridge club to make the venue available. The NSDCA for their donation. Pete Shaw who helped John, Matthew and myself return the building to normal after the event. Steve Emmerton and Abigail Sergeant who played odd games to enable me to maintain my record of ensuring everyone had a game every round. All the players, who collectively made the event so civilised. As ever the pictures on these pages have been cropped and degraded, though in several cases the originals are not wonderful, due no doubt to my inability to hold the camera steady! However originals are available if anyone really wants them. 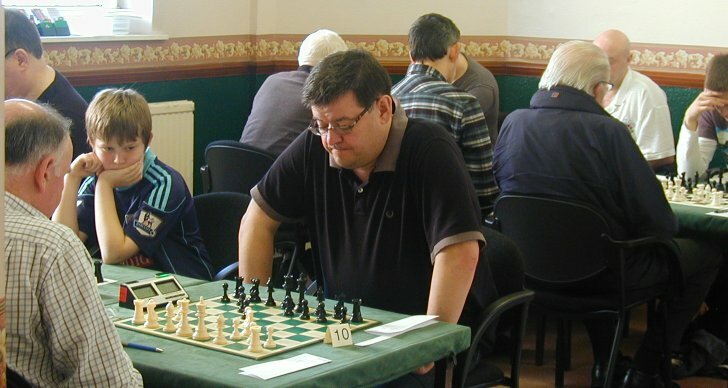 Right: Steve Hill in action concentrating on his own game.